A friend of mine from work recently lost his stepfather after a long ordeal. The family decided on what to get rid of, and one was a box of old tools that my co-worker offered to me at whatever I felt like paying. Based on pictures he sent I offered up $140, and they took it. All in all, after seeing what I got it was a fair price. I had some of these, but not some of the others. The smoothing plane was a non-starter missing the iron (but not the chipbreaker oddly enough), and cracked along the side where the wedge pushes out. I was hoping for this since I don’t have a real good wood smoother yet. But maybe I can use it as a pattern (and beef up the wall where it broke). 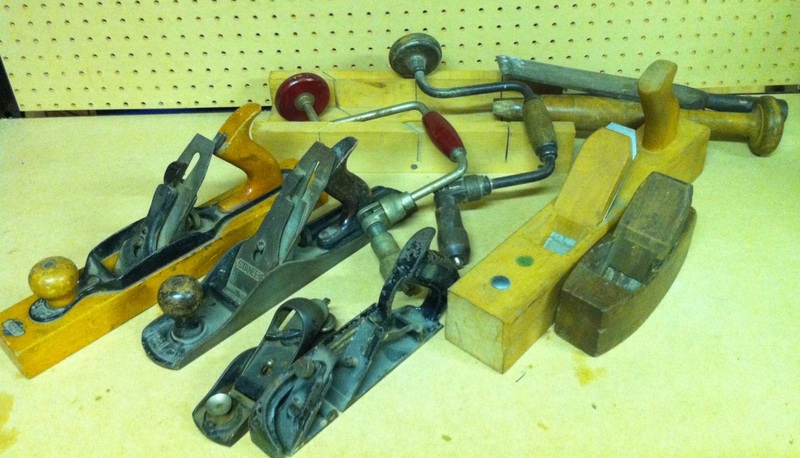 The ECE Jack plane is a winner though, and in good shape. The rabbet, block, jack are all Stanely and in good shape. The transitional plane is interesting, and I’ll see what it’s got going on. The braces look to be ok, and the miter box is nice and solid. They threw in an old boat slick for free, and I’m considering giving it a try as a turning tool on my spring pole lathe. All in all, I am going to treat the tools with respect because they came from a friends family. And it gives me options for when I work on my planing, because I can tune them different ways. They were happy to have them go to someone who might use them, so I’m intended to do just that.